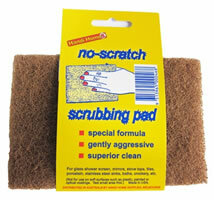 Handihomes No-scratch Pad is formulated using the extra hard grit of organic walnut shell. This means the pad is more aggressive than other no-scratch pads and provides more thorough cleaning without any scratching, pitting or gouging. Handihomes No-scratch Pad can be used safely on many surfaces including glass showers screens, non-stick pots and pans, drinking glasses, porcelain baths, sinks, toilets, glazed tiles, mirrors, windows, car windscreens, boat glass, oven glass, stainless steel sinks and appliances glass and ceramic top stoves, chrome taps and fixtures, anodized aluminium, granite counter tops, laminate surfaces and sealed wood floors. Handihomes No-scratch Pad works beautifully with an approved hard water stain remover to get your glass shower screen free of the toughest hard water stains, heavy white residue and spots. Handihomes No-scratch Pad is extremely durable for long lasting performance. It can be washed clean in your dishwasher with safety, without shedding fibres. Copyright Handi Home Supplies, All Rights Reserved.